In order to reach the villages of Gărâna and Brebu Nou, which are nowadays united as one village, one has to pass Văliug on the Semenik Plateau. According to local legend, the village was given its name by Emperor Franz II who gave the leaving migrants the following motto for their journey: “Do not forget our beloved God, built your houses and name the settlement after me”. On June 29th 1793, 71 families came to the thick woods in the Semenik Mountains. The built wooden houses there and founded a village they called “Franzdorf” (Franz village). Only thirty years later, Germans from Bohemia settled the Semenik Plateau. It was their job to protect the south-eastern border of the Habsburg Empire against Ottoman troops and to cultivate the land. Both villages on the high plateau survived even after the Garrison at Caransebeş was dissolved in 1872. Gărâna and Brebu Nou flourished in the early 20th century. With the fall of the Iron Curtain in 1898, many inhabitants left the idyllic village life and went back to Germany. Between 1990 and 1992, more and more people left the villages for the regions of Cham and Traunstein. The village organist Sepp Irlweg, who often accompanied one of the last regular Sunday Masses in the church, attracted the attention of filmmaker Thomas Ciulei. Ciulei was a student of Munich’s film academy back then and shot a documentary called “Like a bird on the fence…”. 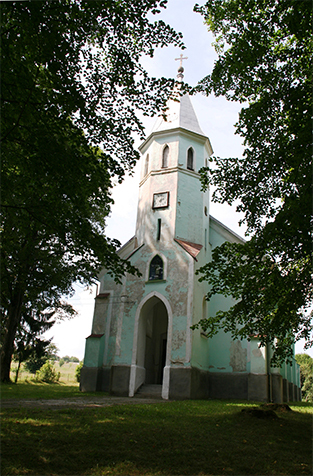 In the film, which deals with the migration of Germans from Bohemia, Irlweg’s organ play and his wife’s singing can be heard while images of the empty village are shown. The local Kirwa (parish fair) is one of the most important fairs of Germans of Bohemia. It is held in late fall and is organised by youth associations, folklore groups, dance groups and brass bands. Over the years, a distinct Kirwa for the Swabian Banat developed. It has many traditions, such as the decorated parish fair tree which is erected by the men of the village or the daring girls who climb the tree and let themselves be carried on it, before it is placed in the square. The Roman-Catholic church of Brebu-Nou is only used for the parish fair and events nowadays. 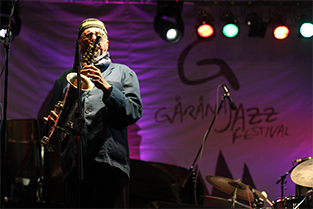 The Gărâna-Jazz-Festival, one of Romania’s biggest Jazz events, is held in Gărâna every year.